In building and developing my own leadership team, I find myself teaching many of the same things I was taught at NC State’s College of Education. We put students and their experience first here at Richmond Community College, and that is a philosophy that was integral to the courses I took at NC State. I was very fortunate when I started in the program in 1998 that I was serving as a Vice President and Chief Financial Officer at Montgomery Community College. I never expected to have to do more than the MBA I had already earned but quickly realized that a PhD would be required to retain a vice presidency or to move up to a presidency. When I entered the program at NC State, legends in the field of higher education walked the halls of the College of Education. Dr. George Vaughan was the chair of my committee which also included Dr. Edgar Boone, Dr. Conrad Glass, and Dr. George Baker. The goal of the College’s program was to create and build higher education leaders for North Carolina and around the country. When I graduated in 2002, I had gained the confidence that I had been taught by the best in the field. Today, I still talk with my staff and faculty about Baker’s theories on transformational versus transactional leadership. I use Boone’s book on community-based programming to guide our college in developing continuing education courses. I have Vaughn’s books on community college trustees and the presidency on my bookshelf and have referred to them frequently. I would advise students who are planning on pursuing doctoral studies to pick the right moment in life to embark on the journey, and fully commit. Once you are committed to the undertaking, finish the program. It is as much a test of your endurance as your intellect and talent. There is no such thing as an ABD. Defend the dissertation, and earn the degree. 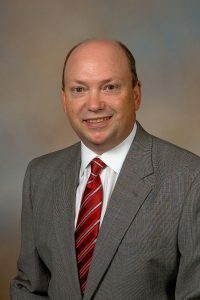 Dr. McInnis actively serves on committees at the NC Community College System and on the NC Community College President’s Association. His service in Richmond County won him recognition as the Chamber of Commerce Citizen of the Year.